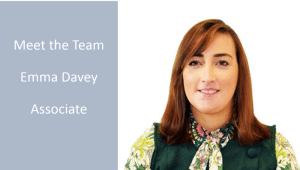 Today we talk to Emma Davey, Associate, who specialises in Wills, Probate, Court of Protection Work and Lasting Powers of Attorney at our Launceston office. I applied for a work experience placement at a firm of Solicitors when I was 14 years old. I was then offered a position as an office junior to help around the office after school and during school holidays. From being in the office, I found that I had an interest in law. With offices in Newton Abbot, Torquay, Bovey Tracey, Exeter, Launceston and Paignton, there are a variety of legal services can be accessed easily across Devon and Cornwall. I enjoy the personal aspect of private client work. By spending time getting to know my clients and their families, I am better placed to help them with their legal problems. What have been the most interesting developments in your industry during 2017? This April the new “Residential Nil Rate Band” for inheritance tax was introduced. For clients to be eligible their estates must meet a number of conditions. In light of these changes it is important for wills to be regularly reviewed to ensure it has been drafted in the most tax efficient way. That lawyers are boring and stuffy. At WBW, I think that we are an exciting and interesting group of people. I love to travel and I like a challenge. So I have put the two together and hope to visit 40 countries by the time I am 40. I have visited 31 so far. Any recommendations on countries to visit are always welcome!